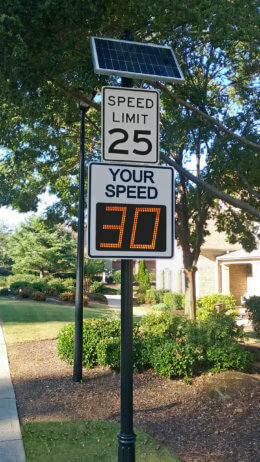 A solar power radar speed sign is an excellent choice when a permanent location is desired. It is also a very good option when an AC power source is not readily available or is expensive to run. Our unique SmartCharge energy management software ensures an orderly shutdown of the signs whenever battery power approaches 20% of the remaining charge. This ensures that the battery life is maximized. Completely exhausting the battery power reserves diminish the battery’s ability to recharge fully. The next day of just a couple hours of sun will reactivate the sign. There are two solar panel sizes to choose from, a 46 watt panel or a 65 watt panel. The TC-600S and the TC-1000S will run efficiently enough to operate 24/7 in most of the United States geography. Even a week of total darkness would not keep either sign from operating. Another benefit of the 46-watt panel is that it is small enough to be unobtrusive in a neighborhood setting. Recommended for locations in northern latitudes and for sites where traffic volume is very high ( > 10,000 vehicles per day ). Refer to the US City solar energy averages summary to determine the hours per day of solar energy where you live. Once you have determined the solar energy hours of your location refer to the traffic volume and power estimates summary to determine whether you need a 46 watt or 65 watt panel.